Princess Diana's final resting-place is in the grounds of Althorp Park, her family home. The original plan was for her to be buried in the family vault at the local church in nearby Great Brington, but this was changed by her brother, Earl Spencer. He said he was concerned about public safety and security and wanted his sister to be buried where her grave could be looked after properly and visited in privacy by her sons. 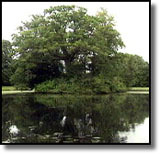 The actual area for burial is on an island in an ornamental lake known as The Oval within Althorp Park's Pleasure Garden. An ancient arboretum stands nearby, which contains trees planted by Prince William and Prince Harry, other members of her family and the princess herself. 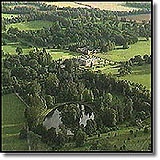 Althorp House, her family home, set in 15,000 acres of Northamptonshire countryside, stands a mile away. In five centuries, 20 generations of the family have been buried in Spencer Chapel - including Diana's father, who died in 1992. Earl Spencer, Diana's brother, said the princess's committal service would be private, short and conducted by an unnamed priest who is a family friend. "Respect for the family's privacy at this stage is thought to be only just, in view of the public nature of the earlier part of the day," he said. "The family has wholeheartedly agreed that it would be appropriate for Diana, Princess of Wales, to receive a public funeral at Westminster Abbey." Great Brington is the nearest village to Althorp Park. It is a village of 200 with a post office and a pub but no public toilets or coach parking and seems ill prepared to host either the immediate media invasion or the flood of tourists certain to arrive for years to come. The village's name means 'town on the brink', because of its location on a 400ft hill. After the nearby ceremony, locals fear that is literally what it will become. Locals fear the intensity of interest could overwhelm Great Brington. Another villager said: "It will be like Elvis's grave. Everybody will want to come here just to pay their respects." Althorp House is already open 60 days a year and costs �a person to visit. After inheriting the home after his father's death, Earl Spencer said his stepmother had spent �million converting it into something like a "five-star hotel in Monaco". In a bid to stop yearly losses of �0,000, he opened the house's doors to business two years ago and hires it out for corporate entertainment. Diana moved to Althorp House in 1976. She was said to love the grounds and house, which was bought by Sir John Spencer in 1508 - despite rumours of ghosts haunting its many corridors, halls and rooms. In one story, Jack, the seventh Earl of Spencer, appeared a year after his death when his son, Johnny, married Diana's stepmother in 1976. A family member who died as an infant is also said to haunt the picture gallery. A former Althorp cook, 76-year-old Betty Andrews, said Diana's time in the house remained with her throughout her later days as a royal. "Looking back, it was probably the happiest time of her life," she said. "You get the sense that she is coming home. Her father is buried here. I'm sure it is what she would have wanted." The house itself was extended into a large mansion in 1790. Over the course of time, the Spencer family collected one of Europe's finest private collections of paintings and china - although many of these valuable items have been sold off in the past two decades in order to pay for the high running costs of the house. Even before her marriage to Prince Charles, Lady Diana Spencer was hardly a commoner. Genealogists calculated she was her husband's seventh cousin once removed and traced her bloodline to George Washington, Humphrey Bogart, Bonnie Prince Charlie and Rudolfo Valentino. Diana had five lines of descent, mostly through illegitimate children, from King Charles the Second, who reigned in the seventeenth century. This pedigree linked her to the Stuart dynasty, which, because of its Roman Catholic faith, lost the throne to the Protestant Hanoverians, the family of her former husband, Prince Charles. Among the princess's Spencer ancestors were the Second Earl in the consecutive historical line, George John Spencer, who served in the British navy in the early nineteenth century, and the fifth Earl Spencer, who was Viceroy of Ireland under Queen Victoria. The princess's brother, Charles Spencer, inherited the title and the estate five years ago, after the death of their father. Their mother, Frances, divorced from their father when the children were still young. She subsequently remarried and now lives on a small island off the west coast of Scotland. Her former husband, the eighth Earl, also married again. His second wife was Raine, whose mother is the romantic novelist, Barbara Cartland. Diana was not the first lady from her family to have been wooed by a Prince of Wales. More than 250 years ago, a Lady Diana Spencer was offered to the then prince by her grandmother, Sarah, Duchess of Marlborough, with a portion of �0,000. Apparently, the prince accepted and a date for a secret wedding was set, before the plan was scuppered by the intervention of the Prime Minister, Sir Robert Walpole. Another famous Spencer daughter, Georgiana, was for 25 years the closest female companion of the Prince of Wales, later George IV. Royal gossips claimed the pair were lovers, though they addressed one another as "brother" and "sister". In a tribute equally applicable to the late Diana, the Prince described her as "the best natured and best bred woman in England".